errands that needed to be done so going for a run on top of that wasn't an option. I got 4.5 miles in Monday but it wasn't effortless, that's for sure. When you tell someone that you ran four and a half miles, you get reactions anywhere from "wow I don't run that much in a year" to "why didn't you make it an even five?" The thing is, it was tough enough just getting that much in. Most of it was entropy, I run my route such that barring injury even if I quit early, I'm guaranteed to get enough miles (min 3) in that it wasn't a waste of changing into running clothes. Second, getting in that last half mile would have had no tangible benefit, however the extra 4-5 minutes was better spent getting showered and cleaned up and getting back to my kids 5 minutes sooner. Giving my mom who is watching them some relief. Today I plan to meet a friend for a run in the cold. 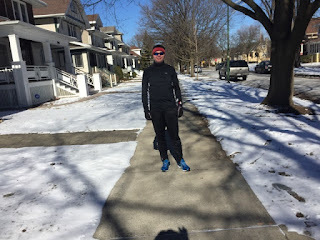 The tricky part about winter running sometimes is you actually have to let more of the day go by before donning your running clothes because it can be significantly warmer later in the day. If we ran this morning it would be 7 degrees but by waiting until 11 am, it will be more than twice that: a balmy 16 degrees.